Bavay (Bagacum or Bavacum in Latin, pop. 3,500) is a village in in the département du Nord, district of Avesnes-sur-Helpe. 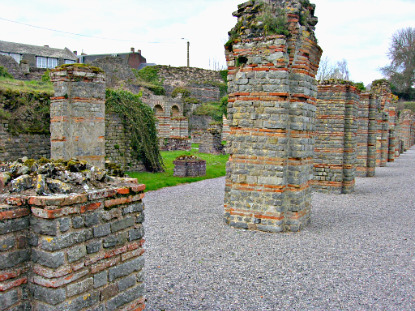 After the conquest of Gaul by Julius Caesar, Bavay became the capital of the Nervians (Nervii in Latin), a Belgic tribe, Celtic by culture but Germanic by blood. 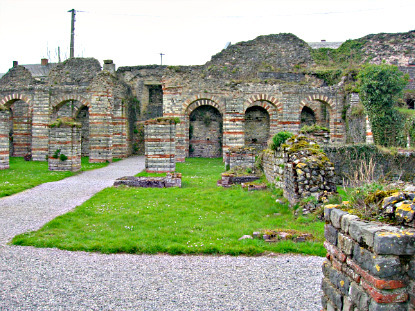 Archeologists estimate that the Roman town was not founded earlier than 20 BCE. Emperor Augustus reorganised the province of Belgica in three sections : Belgica, Germania Inferior and Germania Superior, with the modern city of Reims as the provincial capital. Bavay stood at the border of Belgica and Germania Inferior. Each tribe was organised into a district with a civitas (administrative town). The Nervians occupied the region between the rivers Scheldt, Sambre and Meuse, an area roughly corresponding to the old County of Hainault and the Prince-bishopric of Cambrai, or in modern terms the Belgian province of Hainaut and the districts (arrondissements) of Avesnes, Cambrai, Douai and Valenciennes. Bagacum was an important center in the Roman road system. It was connected to the war port of Portus Itius (Boulogne-sur-Mer), on the way to Britannia, as well as to the other tribal capitals in the region, like Atuatuca Tungrorum (Tongeren), Castellum Menapiorum (Cassel), Samarobriva (Amiens), Durocortorum (Reims) and Augusta Treverorum (Trier). The city was destroyed during the Germanic invasions and never recovered its old importance. In the 12th century, it had its own provost within the County of Hainault. In the next two centuries, it acquired a city wall. It was annexed to France by Louis XIV, as was most of the département du Nord. Nowadays, Bavay is just a peaceful village of little importance. The only reason to come here is to see the ruins of the Roman Forum. They spread over 2.5 hectares (6 acres), making it the largest site of the kind north of the Loire River. There is also a small Gallo-Roman museum with a few bronze statues and artifacts. Bavay is about 60 km from Lille, on the N49 motorway between Valenciennes (10km) and Maubeuge (8km). It is 15min by local train from Valenciennes.